An advanced motorsport collection that would take endless time and resources to duplicate, we have a large grouping of substantial Formula One champions and Grand Prix winners autographs totaling over 300, with a number of rare and highly desirable specimens. 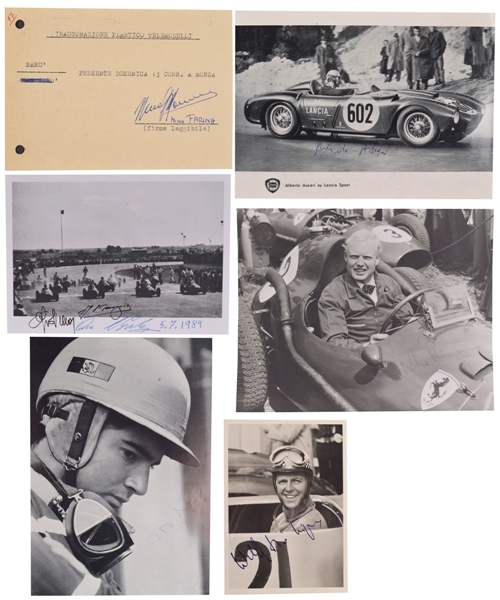 Highlights include a card with Italian typed-text signed by Nino Farina (D-1966), an advertising card signed by Jochen Rindt (D-1970), a photo card signed by Oscar Galvez (D-1989), a postcard signed by Lorenzo Bandini (D-1967) and a signature cut along with an advertising card both signed by Gilles Villeneuve (D-1982). This is followed by photos signed by Juan Manuel Fangio (10 D-1995), Alberto Ascari (2 D-1955), Mike Hawthorn (D-1959), Jochen Rindt, Ayrton Senna (2 D-1994), Ricardo Rodriguez (D-1962), Wolfgang Graf Berghe von Trips (D-1961) and Peter Collins (mulit-signed D-1958). Also featured in the remarkable collection are Patrick Depailler, Jose Froilan Gonzalez, Richard Ginther, Carlos Pace, Didier Pironi and many others. A JSA Auction LOA will accompany. Additional highlights include Phil Hill, Jim Clark, Denis Hulme, James Hunt, George Eaton, Michele Alboreto, Giancarlo Baghetti, Bruce McLaren and Gunnar Nilsson. Rounding out the lot we also have Alesi, Arnoux, Barrichello, Beltoise, Berger, Boutsen, Brambilla, Brooks, Coulthard, Fisichella, Frentzen, Gethin, Ginther, Gurney, Herbert, Ickx, Ireland, Irvine, Jabouille, Laffite, Massa, Montoya, Moss, Nannini, Pace, Panis, Patrese, Regazzoni, Reutemann, Rosberg, Tambay, Trintignant, Trulli, Watson, Webber, Brabham, Surtees, Stewart, Fittipaldi, Lauda, Andretti, Scheckter, Jones, Piquet, Prost, Mansell, Schumacher, D. Hill, Hakkinen, Raikkonen, Hamilton, Button, Vettel, Berg, Brack, Cordts, Wietzes, Larrauri, Mazzacane, Mieres, Rebaque and a few others. The majority of the items in the collection are signed photos, including many showing the respective driver’s car. Varying inks have been used, with the collection nicely stored in three leather binders. The Farina card is 4” x 5 ¾” and signed in blue ballpoint, the advertising card with photo signed by Jochen Rindt is 4” x 6” and in black marker, with some fading to the signature. The photo card signed by Oscar Galvez is 4” x 6” and in ballpoint, date 1989, showing light wear, while the postcard signed by Lorenzo Bandini is 4” x 6” and in ballpoint, with a few creases.